Metallurgy is a domain of materials science and materials engineering that studies the physical and chemical behavior of metallic elements, their intermetallic compounds, and their mixtures, which are called alloys. Extractive metallurgy is the practice of separating metals from their ores and refining them into pure metals. To convert a metal oxide or sulfide to a metal, the ore must be reduced either chemically or electrolytically. In general, the ore is first broken up through crushing and grinding, to generate small particles. The particles that are mostly valuable are then separated from those that are mostly waste. Various separation techniques are employed to concentrate particles of value and discard waste. In this process, extractive metallurgists are interested in three general streams: the feed, the concentrate (valuable metal oxide or sulfide sulfide), and the tailings (waste). Ore bodies often contain more than one valuable metal. Thus the feed might be directly from an ore body, or from a concentrate stream, or even from the tailings of a previous process. Common engineering metals are aluminum, chromium, copper, iron, magnesium, nickel, titanium, and zinc. These are most often used as alloys. Much effort has been placed on understanding one very important alloy system, that of purified iron, which has carbon dissolved in it, better known as steel. Normal steel is used in low cost, high strength applications where weight and corrosion are not a problem. Cast irons, including ductile iron are also part of this system. Most engineering metals are stronger than most plastics and are tougher than most ceramics. Composites of plastics and materials such as glass fiber and carbon fiber rival metals in applications requiring high tensile strength with little weight. Concrete rivals metals in applications requiring high compressive strength and resistance to the effects of water. Wood rivals metal in applications requiring low cost and availability of materials and low cost of construction, as well as in applications requiring certain aesthetics. The operating environment of the product is very important—a well-designed material will resist expected failure modes such as corrosion, stress concentration, metal fatigue, creep, and environmental stress fracture. Ferrous metals and some aluminium alloys in water and especially in an electrolytic solution such as seawater, corrode quickly. Metals in cold or cryogenic conditions tend to lose their toughness becoming more brittle and prone to cracking. Metals under continual cyclic loading can suffer from metal fatigue. Metals under constant stress in hot conditions can creep. 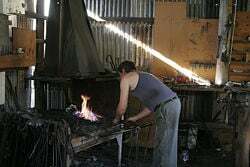 A blacksmith works at his forge. Metals are shaped by processes such as casting, forging, rolling, extrusion, sintering, metalworking, machining and fabrication. With casting, molten metal is poured into a shaped mold. With forging, a red-hot billet is hammered into shape. With rolling, a billet is passed through successively narrower rollers to create a sheet. With extrusion, a hot and malleable metal is forced under pressure through a die, which shapes it before it cools. With sintering, a powdered metal is compressed into a die at high temperature. With machining, lathes, milling machines, planing machines and drills are used to cut the cold metal to shape. With fabrication, sheets of metal are cut with guillotines or gas cutters and bent into shape. "Cold working" processes, such as rolling and fabrication, where the product’s shape is altered while the product is cold, can increase the strength of the product by a process called work hardening. Work hardening creates microscopic defects in the metal, which resist further changes of shape. Various forms of casting exist in industry and academia. These include sand casting, investment casting (also called the “lost wax process”), die casting, and continuous casting. Welding is a technique for joining certain ferrous metals and certain aluminum alloys. The metals in the weld and on both sides of the join are generally similar alloys. Brazing is a technique for joining copper-based metals. Metals can be heat treated by annealing, quenching, tempering, and case hardening to alter properties of toughness, hardness or resistance to corrosion. Annealing is used to make a shaped product tougher by reducing the effects of work hardening, it also softens the metal. Quenching and case hardening are used to make a shaped product harder. Quenching by it self makes the metal very hard and very brittle, tempering after quenching is used to reduce the brittleness and improve overall properties. Electroplating is the main surface treatment technique and involves bonding a thin layer of another protective metal such as gold, silver, chromium, or zinc to the surface of the product to reduce corrosion. Metallurgy is also applied to electrical and electronic materials where metals such as aluminum, copper, tin, and gold are used in power lines, wires, printed circuit boards, and integrated circuits. Metallurgists study the microscopic and macroscopic mechanisms that cause a metal or alloy to behave in the way that it does—that is, the changes that occur on the atomic level that affect the metal's (or alloy's) macroscopic properties. Examples of tools used for microscopic examination of metals are optical and electron microscopes and mass spectrometers. Metallurgists study crystallography, the effects of temperature and heat treatment on the component phases of alloys, such as the eutectic, and the properties of those alloy phases. The macroscopic properties of metals are tested using machines and devices that measure tensile strength, compressive strength, and hardness. ↑ Intermetallics are alloys of two or more metals in a certain proportion, thereby forming a new chemical compound. The resulting compounds are chemically different from either of the two alloying agents, and offer additional benefits or drawbacks, depending on the intended use of the alloy. This page was last modified on 10 November 2008, at 15:25.